We began in 1976. The Line up is the same as now. with an addition of Mel's brother Scruff on rythm guitar. The biggest high was and still is playing a great gig and the lowest point was signing to sire records. Would the Adicts allow one of their songs appear in a commercial? If yes, which song and what would you like it to be advertising? Good question, we just recorded a track which is perfect for a car commercial. but out of our old ones....Straight Jacket to promote the Police Force. Or Viva la Revolution for a Shampoo. If the Adicts were a type of alcohol, what drink would they be and why? Guinness and Champagne mixed together. Bubbly and Creamy Orgasmic. 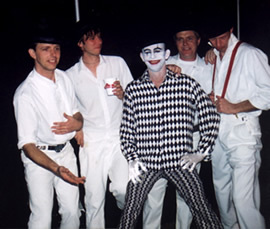 The Adicts arent your everyday punk rock band we change every day, its like a on going thing. We are always asked why dont we write songs like on our first album? Well after all this time that would be boring. We dont follow trends or fashions, we have always stood apart from the rest. Just watch out we might even suprise someone one day and write a decent song, WHO CARES is our slogan...we still have all our punk rock values even if they have grown stronger in most cases.And we still sell records so some one is happy out there and thats class!